Registration for the 2018 Mustang Week Car Show is now open. For those that wish to be part of the judging, the pre-registration fee is going to be $45. In 2018 we will bring back a very popular option for the Mustang Week Car Show. We will also offer “display only” spots for Friday’s Car Show. With this option you will be able to park inside the show field during the Car Show; however, your car will not be judged. This allows the participant to park early, be in the middle of all the action, displaying your car in what is sure to be one of the largest Mustang and SVT shows to date. The cost for a display-only spot will be $35. Once you have registered for either “judged” or “display only,” there will be no changes allowed, so please put careful thought into which you choose. No late entries will be accepted. Check-in for the show will be between 8:00 am and 11:00 am the day of the show. As an added special bonus, those pre-registered for both the judged portion or a display only spot, during Friday’s Car Show, will be given a two-day parking pass that will get you into Saturday’s Meet-n-Greet at no extra charge. So even though I had searched the WEB for the 2019 Mustang Week Info, it gave me 2018 info, and I blindly pasted it here. Registration opens May 11, and the dates and events I previously listed are not accurate. The dates ARE September 2-8, 2019. Updates to follow. 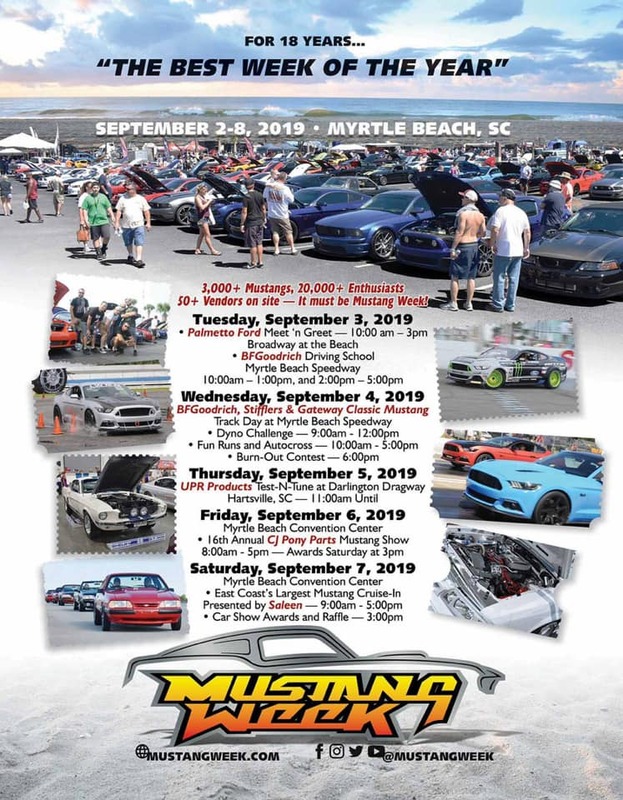 So they put it in a poster before print, but attached is the itinerary for the 2019 Mustang Week. I am currently making plans to go and am looking for an entire house to rent. I am also looking for someone who might want to share to cut down on costs. I will once again be trailering up and staying the duration. * I am awaiting confirmation that all 3 days will be at Darlington. Ok, she is 24 and living on her own, but I do have a kid. Ok, Day 1, Sept 3rd and day 2, Sept 4th will be at Myrtle Beach Speedway, a half-mile oval track close to the beach. Day 3, Sept 5th will be at Darlington Race track for the Drag Races. Last edited by 69GT350H; 04-08-2019 at 01:10 PM. I have rented a house in Calabash, NC, just over the border from SC, about 30 min from the Myrtle Beach Convention center. So yea, I'll be there.